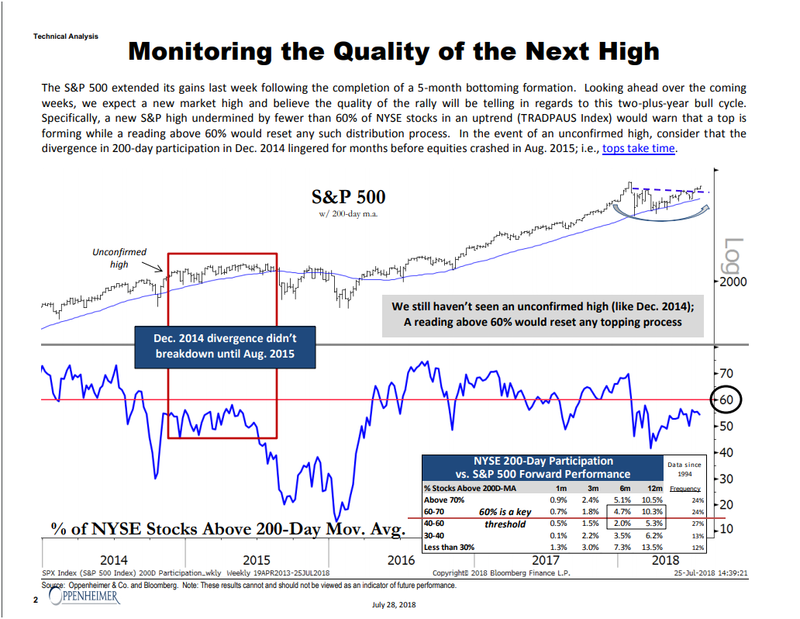 Further new highs can be expected for the S&P500 in the coming weeks although it remains to be seen how sustained these will prove to be, says Ari Wald at Oppenheimer. If the number of NYSE stocks that are above their 200-day moving average moves above 60%, then this would suggest the two year bull cycle in US stocks will remain in place for the time being. Otherwise, a topping pattern can be expected to form. This would then be a similar occurrence to the divergence in 200-day participation seen in late 2014 before stocks fell sharply in August 2015. August and September are typically weaker months for the S&P but a softer performance over this time is likely to be only a pause rather than the start of a decline, adds Wald. A further addition to a positive outlook for the index is that the equally weighted index has also risen 5% this year highlighting that gains have been spread throughout the index and are not overly dependent on FANG stocks.